If you are a die-hard fan of cyclocross then your season started when Bradley Wiggins crossed the finish line in Paris wearing the coveted yellow jersey and started drinking champagne with his teammates. However, if you’re a mountain biker or roadie then September or October typically marks the beginning of cyclocross season for you. It is crucial to start the season fresh, both mentally and physically. Make sure you have taken time to decompress and rest up since your last race or training block. It’s also important to enter the season with a certain amount of fitness so that you are prepared for the demands of cyclocross training and racing. If you have had a busy summer going to national-level mountain bike races, or state and national-level road races, you should think about taking some some time off of scheduled riding. Racing bikes really beats down the human body and wears on the mind. You don’t want to start the cyclocross season feeling your tired legs from all the hard efforts you had during the summer. Cyclocross is both physically and mentally demanding and you want to have your wits about you when you’re approaching the barriers at Mach 2, and daring yourself to get off the bike just a little closer and at slightly higher speeds. Put away your cycling computer and heart rate monitor and just go riding for the fun of it. Remember when you started cycling? You did it for fun, so get in touch with the kid in you again. If you are a roadie then get on the mountain bike and go for some easy rides, maybe even explore some new trails. For you mountain bikers it would be a good time to dust off the cyclocross bike and go on some easy road rides. Generally speaking one to two weeks should be plenty of time to decompress and get you ready. Now that you are mentally ready, it is time to prepare to physically transition into cyclocross season from the road or mountain bike. Cyclocross racing is about the “hour of pain”. The start is like a fist fight, the middle is about learning the course and figuring out your opponent’s strengths and weaknesses, and the end is yet another fight, to either defend your position or to catch that rider in front of you. Another way I like to put it is that cyclocross is sort of like playing chess with your heart rate somewhere around lactate threshold the whole time. I hate to say it but, it’s time to get your running shoes on. You don’t have to go on 10 milers, just 20-30 minute runs at a super easy pace to get your legs used to running again. Once you are closer to your first race then you can include some short, uphill grass or dirt sprints to prepare you for those run-ups. 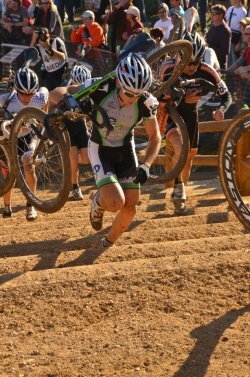 Cyclocross is very demanding of your legs and upper body and you can easily lose positions through the barriers or on run-ups by not having a strong core. Your core is the weak link connecting your legs and upper body, so core strength becomes crucial for fast run-ups and getting over barriers quickly (and not having back pain). Start with 5 minutes of core workouts at the end of each run session, and gradually build that to about 25 minutes. Do core workouts with good form. Don’t neglect your back (that is also part of your core). In Part 2 of this series coming out next week, we’ll cover functional core exercises for cyclocross. Start some of your workouts by lifting your bike 30-40 times, pretending like you are lifting it over a huge obstacle. Do it until it hurts, and then do it some more. Work on cornering skills. Dust off your cyclocross bike and take it to your favorite park. Find a couple of trees that are 20-30 feet apart. Use these trees to do the “oval” drill. Go around them turning in one direction, learn to lean the bike into the corner as you put most of your body weight on outside pedal. Do this slowly and then gradually pick up speed in order to build confidence in your cornering. Don’t forget to switch directions. Do this until you get as dizzy as my four year old son twirling around in the playground. Then do some figure-eights. Find some logs and use them as natural barriers and practice your barrier skills at very slow speeds. Dismount the bike, and don’t rush it. Cyclocross races are all about sprinting. He who sprints the hardest and most in one hour will come out victorious. Start throwing in a dozen or more sprints into one of your weekly workouts. Here’s an example workout that I would suggest as a “big workout” on the weekend. 8 x 20 second all-out sprints, with 10-second recovery. Ignore heart rate, power, and everything else, trust me on this. For the next 30 minutes: 15 x 10-second all-out sprints every 1:50 minutes. Don’t coast in between, put enough power into the pedals so that your power meter registers your existence (Endurance power level at 65-75% of FTP. If not using power meter, then go by feel and try and keep your legs moving, just no coasting). Follow this pattern for the entire 30 minutes. 5-minutes at threshold power immediately followed by 5×30 second all-out sprints, with 30 seconds’ rest between all sprints. You can coast between sprints…but would you do that if it were the last lap and you were being chased? This workout will teach you how to handle all the sprints in a cyclocross race, and then finish the last lap hard and sprint for the finish. Yes, your legs will be empty, but then again they will be even more empty at the end of the cyclocross race. In addition to a very tough workout like this for your Saturday or Sunday, you should have 2 other cyclocross practice and race effort workouts during the week, with rest days in between. Example: Tuesday, cyclocross practice-effort workout, Thursday, cyclocross race-effort workout, Sunday my “Sprints Galore” workout). On top of this, before the first race of the season, there should be more emphasis on skills and running. Do 2 runs/week and 2 skills sessions/week. Once the racing starts cut down to 1 of each per week. Cyclocross races are hard but they make you strong. They are fun, spectator-friendly, and even family friendly. Cyclocross workouts and drills are usually extremely demanding, but they are always going to be shorter than your road or mountain bike workouts, and in the end it gives you the perfect excuse to jump on your bike and get really muddy. By the end of the cyclocross season you will have monstrous power levels and be ready to battle in your main arena. Part 2 of this series with focus on improving your core strength for cyclocross.